Lexra’s MIPS cores were not licensed from MIPS, nor did they need to be, they merely implemented the MIPS instruction set, not copied the MIPS transistor level designs. When MIPS was spun out of SGI in 1998 one of their first activities was to sue Lexra, Lexra agreed to not market their cores as ‘MIPS Compatible’ and life went on, until MIPS decided to sue again, over a patent (whose validity was in question) on unaligned loads and stores. They ended up settling, paying Lexra $10 million and cross licensing various technologies as well as forcing Lexra to stop licensing its cores and eventually out of business in 2003, just as ARM began to really take the market by storm. More of the Lexra story can be read here on Jonah Probell’s page, who used to work there. Lexra greatly enhanced the MIPS design, and produced several notable firsts including IP cores with 6 and 7 stage pipelines, MIPS16 (a microcontroller focused version) code compression, DSP extensions, EJTAG support (for debugging and dev work), and multi-threading support (which proved very useful for network processing). In less then 6 years Lexra developed and licensed 9 processor cores, all as soft cores, for easy integration. Lexra’s demise is what ended up making ARM such a wild success. 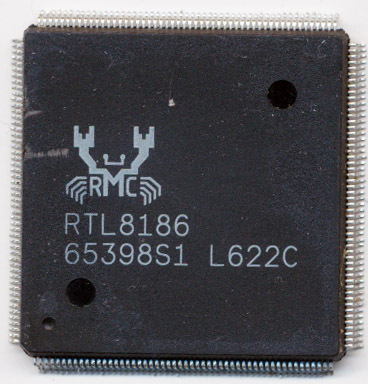 In the late 90’s and early 2000’s there was a bit of a battle between ARM and MIPS for embedded RISC market control. The battle was not won by ARM though, it was lost by MIPS. It would be very interesting to see where MIPS as an architecture would be today had they concentrated on making it readily available as a soft core rather then fighting another member of their ecosystem. As a testament to Lexra’s designs, many are still being used, the Realtek pictured above was in fact made in 2006, 3 years after the demise of Lexra. Realtek, a creative Taiwanese company, assembled its own team of processor core designers and has taken the basic Lexra core and improved it themselves. The architecture and instruction set is sound, robust and still useful (and used) today but unfortunately corporate politics choked its chances at truly shining, allowing ARM to win by default.